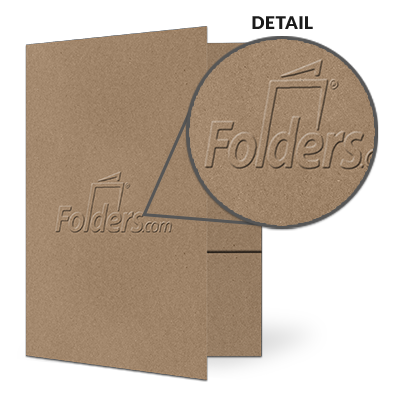 Custom Folders can be created using a variety of different print methods. Below are detailed descriptions of each print method to help you make a decision on what works best for your specific project. 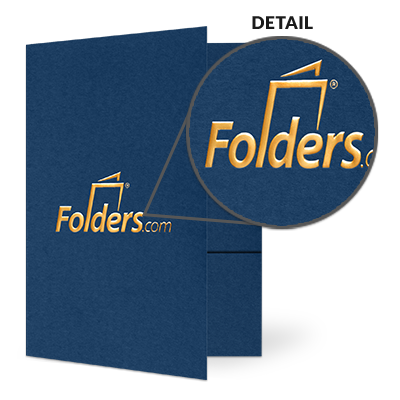 Whether you're looking for Foil-Stamped Folders, Printed Folders, Embossed Folders, or any combination of those options, we'll help you create the perfect custom Folder! 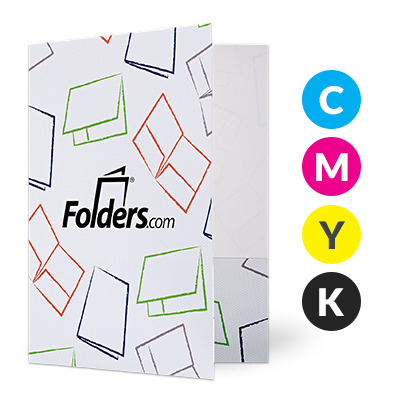 Full-color printing is a great folder decorating method for reproducing images and artwork. If your design includes full-color photographs, four-color printing is required. The Full-color printing process is also known as CMYK or Four Color Printing. CMYK stands for cyan, magenta, yellow, and key (black). This is the industry standard in producing full color printed media that we apply to custom folders. Please be aware that with four-color printing a very subtle shift in color may occur from the original design due to the folder color you choose, and several other factors. Spot color refers to color produced in offset printing by a single ink. A spot color could be a "pure" color, or a color that's pre-mixed to a set formula. For designs that need an exact color printed, a spot color is used because it's the most efficient method of controlling color. In brand marketing, across graphic elements such as text, icons and backgrounds, spot color offers consistent color matching. Our most popular foil colors are displayed in our Foil Color Chart. Metallic foils include gold, silver, and a range of metallic colors with mirror or matte finishes. Non-metallic foil colors have a gloss finish. Other types of foils are available on a special-order basis including holographic patterns, matte finish non-metallic colors, pastel colors, pearlescent colors, and tint foils. Most types of paper can be embossed, and size is not normally a consideration. Embossing without ink, so that the image is raised but not colored, is called "blind embossing." Embossing used in conjunction with ink, so that the raised area is colored, is called "color register embossing." "Debossing" is similar to embossing, but recesses the design rather than raising it. Embossing used in conjunction with foil stamping is called "combination stamping" or "combo stamping." Embossing is typically accomplished by applying heat and pressure with metal dies, usually made of copper or brass, that fit together and squeeze the fibers of the substrate. The combination of pressure and heat raises the level of the image higher than the substrate.